~ Alexander, Christopher (2001) The Phenomenon of Life (The Nature of Order Bk 1-4 )CES Publishing, Berkeley, Ca. ~ Basseches, Michael Dialectical Thinking and Adult Development.Ablex Publishing Corp. Norwood, New Jersey. ~ Cook-Greuter, Suzanne Nine Levels of Increasing Embrace. Retrived from http://cook-greuter.com. ~ Gendlin, Eugene (1997) A Process Model. University of Chicago, Chicago, IL. (1991) Thinking Beyond Patterns: Body, Language, and Situations. University of Chicago, Chicago, IL. ~ Goswami, Amit (1993) The Self-Aware Universe. Penguin Putnam, New York. ~ Laszlo, Ervin (2004) Science and the Akashic Field. Inner Traditions, Rochester, VT.
~ Thackhoe, Sonam (2007) The Two Truths Debate. Wisdom Publications, Boston. ~ Thompson, Evan. (2007) Mind in Life. Belknap Press, Cambridge, MA. ~ Trungpa, Chogyam (2004) The Collected Works of Chogyam Trungpa. Shambhala, Boston. ~ Wilber, Ken (2007) Integral Spirituality. Shambhala, Boston. (2000) The Collected Works of Ken Wilber. Shambhala, Boston. Or How do we Get from AQAL to A-perspectival? Integral theory is tricky. In many respects, it is a liberation theory – whether it addresses personal, spiritual or social concerns. At its best, integral theory enables us to dis-embedd from limited perspectival frameworks, and open up into more integrated views. However, at its worst, integral theory is absorbed as a metaphysical reality, as a fixed and static limitation on how we perceive, what we can perceive, and how reality arises. When Wilber writes that AQAL is a map of the prison, the integral community should immediately understand there is no prison except for the map. A-perspectivity is the unconditioned situation of living/being without the map. If we can learn to operate from that unconditioned place, then we can create new maps through which new worlds might arise with greater degrees of freedom and open-up our choice field. If we operate from that unconditioned place we will avoid the mistakes of misplaced concreteness that weld ideas into the bars and barriers of our self-imposed prisons. If we operate from that unconditioned place we will have transmuted the prisons of our selves into the playgrounds of spirit. We will, in other words, enter into the ever-present process of enacting our future. This article is a series of thought-explorations on the nature of the perspectival world and the possibility of shifting toward a-perspectivity. Our starting point is the world of AQAL – the realm of perspectives. Our journey is through three kinds of “shifts” from each of their perspectival constraints toward a more a-perspectival view. In this paper, I will use the term view to represent relative degrees of freedom away from perspectivity and toward the a-perspectival. View, in this sense, is not a static dimensional object, it is a dynamic relationship toward greater degrees of freedom from perspectivity, which is to say, toward a-perspectivity. View, is not to be construed as a reified construct. Metaphor seems better to suit its expression. View can be intuited through a phenomenological felt-sense, a process through which the implicitly-held view is, metaphorically, like the subtle push of wind at your back; what is there below, behind, beneath everything else. Metaphorically, view is the simultaneous ground of your being and the horizon of your own becoming—it is like the a-perspectival “square” you are always standing on, which you cannot see because you cannot get to a perspective from which it can be seen. Phenomenological experiences of this process view share key characteristics. Consider, for example, the way Ken Wilber’s writings articulated the implicitly held view of an entire demographic community. His core audience accepted his writings as something they already implicitly knew, but did not have an adequate expression or framework to carry this implicit view forward. Although his work is highly innovative, to his core audience, Ken Wilber seems to be articulating what is always already the case. He gives us the tools to enact our own view. This experiencing of the “always already” – that some knowledge or truth comes to us in time but is experience as having been always already the case, I term the “ontological dimensioning of reality, and is a hallmark of the unique temporal aspect of view. Another key feature, illustrated so perfectly in Suzanne Cook-Greuter’s video- interview, is this felt-sense that one is already operating from a view with greater degrees of freedom than all one’s perspectival forms available. In her interview, Cook-Greuter’s transcendent insight is “Ah, there is something else.. something totally different;” yet she is not able to supply the perspectival details. This is a very important aspect of this process notion of view—an awareness that even the most suitable forms— when they finally, do come—are only approximations of the “unformed implicit” which is somehow more precise and acts as a kind of “authenticator.” Why does this encounter with view matter? I believe that if we can learn to “feel into” this view and live from this open, unconditioned space by holding the perspectival world “lightly”, then we can access an infinite field of creativity, and open up our choice field and begin to enact entirely new kinds of realities. Until then, we are limited by our perspectival constraints and the world that proceeds forth through them. This world has much to celebrate, but at this point in our history, we also have a mandate to learn to do better, for ourselves, each other, and our environment. Regarding advances in boundary-crossing research many new questions are emerging, among them the following: How “real” are the boundaries delimitating research fields and approaches? How consensual or controversial are boundary-crossing attempts in academic and policy discourse? … Which new research avenues are boundary-crossing approaches? [From a methodological perspective further questions] relate to method and creativity, contexts and generalization, subjectivity and objectivity, reductionism and emergent complexity, and of course, theory and practice. Onto-genetic processes that contextualize time. The ontological entanglement of polarities. The a-local subject simultaneously nowhere and everywhere. Re-conceptualization of dualistic pairs into generative orders. New ontology of wholes and parts. New gestalt of figure and ground. What is it that delimitates the inside and outside in each of these cases? If for example, I think of the inside UL method, phenomenology, and then I switch to the outside UL method, structuralism – what is the nature of this switching from inside to outside? Similarly, what is the nature of the thinking that switches from hermeneutics to ethnomethodology? from autopoeisis to empiricism? from social co-construction theory to systems theory? In each case the inside tends to describe a dynamic, living process, while the outside tends to describes structural features. However, there is little or no correspondence between the two descriptions. Four new future “super-integrative methodologies” that break through the inside-outside divide might be enacted through the capacity to envision non-reductively, and to “see” the dynamic process and its structural properties as a whole, to “see” that the structural properties are latent or implicit in the living process; or alternately, to conceptualize 2nd-person structural properties from the inside experiential activity, and construct a new language wherein the explicit structural properties correspond to the living processes because they carry forward from them. On a very basic level, this is how Gendlin’s (1991, 1997) Process Philosophy construes all language to operate – making explicit what is already precise, but latent or implicit in the living process, through a never-ending continuum of carrying meaning forward. The practice he calls “focusing” is designed to create more precision (correspondence) between the inner “felt meaning” which is a living experience, and the explicit events which are forms, patterns, and instances of languaging. This is also similar to what Evan Thompson (2007) is attempting in expanding Varela’s previous notion of “naturalism neurophenomenology” with Kohler’s principle of isomorphism. Both Gendlin and Thompson point to the “lived body” as the phenomenal ground of experience. This suggests that they position themselves in the UR domain, (where the physical body presents) even as they are integrating across the inside-outside boundaries within the UL and UR domains respectively. Greater insight is required to envision a truly “triple-braided” (to use Varela’s term) methodology where the latent and the implicit are de-coupled from the structural components identified as “the body” and grounded in process dynamics. What characterizes these hypothesized super-integrative methodologies, would be their ability to frame entire domains of inquiry (such as ecology, economics, evolutionary developmental biology, cognitive science) in terms of unified processes that demonstrate isomorphism—or the property wherein all the structural elements are generated by the process field. Alternately, such a methodology would prescribe a framework wherein structures are homologous to discrete transformational phases or generative orders of the underlying process. This attention to dynamic isomorphism, or structural homology characterizes what I envision as “Process Eidetics”, Zone 9 in the following table. 13 UNITIVE ?! Process Eidetics ? 16 HOLISTIC ?! Enactive Naturalism ? 14 CENTAURIC ?! Process Eidetics ? 15 KOSMIC ?! Mixed Discourse ? Zone 13: A UNITIVE onto-logics sees the singular-plural polarity arising from a dynamic prior whole through an interior process, such as an epistemic process. In this case the prior whole tends to be conceived as a kind of consciousness, as is the case with with Amit Goswami’s Self Aware Universe. Zone 16: A HOLISTIC onto-logics sees the singular-plural polarity arising from a prior whole through an exterior force, such as evolutionary process. In this case the prior whole tends to be conceived as a living organism, like GAIA or Errvin Lazslo’s Akashic Field. Zone 15: A KOSMIC onto-logics see the interior-exterior polarity arising from a prior whole with a multiple nature—the counter argument made by the Tibetan philosopher Gorampa. Generally speaking in this way, Wilber’s writings can be seen to have moved from UNITIVE to KOSMIC; as his earlier metaphysical notions were essentially rooted in a more Eastern spiritual concept of subject-permanence, absolute Consciousness (Plotinus’ “One-without- a- second”); while his more recent metaphysical notions of a tetra-emergent holarchy is treated as an originary whole with a multiple nature. A future 2210 cartology of horizons would include this and other insights into the entangled nature of interiors and exteriors, wholes and parts, and allow for entirely new ways of envisioning realities. Still, at the edge of our own future, we find ourselves grasping for an adequate ontology of interior/exterior and one/many relations, and their phenomenal expressions as subject/ object and whole/part. First person process is not a perspective. First person process has been widely misunderstood as being inside an externally-observed body. External and internal are not actually divided. What is implicitly understood is much more than we could separate out one by one… the next event can change the implicit many. So the one-many relation is really a one-many-one relation. The many are not thought separately. They change implicitly without ever having been formed. The IU is often called the ‘background’ so named from the visual experience of ‘ a figure and the background around it.’ The IU contains a great many ‘figures.’ The IU is very precise and governs what is next. Now the word ‘background’ changes to mean something precise and central. Through these kinds of reading and writings, I have begun to envision the key features of a mature version of onto-logical reasoning. In his book, Dialectical Thinking and Adult Development, Michael Basseches (1984) distinguishes late-stage dialectical reasoning from earlier dialectics as shown in the table below, to which I have added a column corresponding to onto-logical thinking. Through differentiation and integration, dialectical reasoning has produced more and more complex, higher and higher levels of perspectives. Although I hypothesize that late-stage dialectics can achieve the kinds of super-integration required to build new methodological hori-zones, I suspect that in the future we will come to realize these as unnecessarily complex, in the same way today we see that Ptolemy’s epicycles were unnecessarily complexified by his geo-centric view. I believe at the core of the next true paradigmatic shift, is a new onto-logical view (which is to say, a post-metaphysically held process ontology); and this shift toward onto-logical reasoning might be a paradigmatic leap that will situate ourselves in a new view where we will be able to create understanding that is less complex but more coherent, meaning that is less discursive but more sharable, and world-enacting narratives that are less totalizing but mutually enriching across domains. From the above table we can quickly sketch out the different types of narratives composed by dialectical, late-dialectical and onto-logical thinking. A dialectical narrative would be organized as a Hegelian transcend-and-include theory, wherein composite structures would be hierarchically arranged in a constructivist manner, (i.e., where if the lower levels are destroyed, all the higher levels are also destroyed), and the lower levels would be synthetically included so that the higher structures subtend the lower structures algorithmically, which results in concepts of transcendent wholes and notions of ultimate transcendent knowledge, and absolute (universal) truths. A narrative told from late-stage dialectics starts by positing foundational forms of existence and their relations rather than from a “pure” theoretical abstraction based on logical categories. These forms themselves are construed as the primordial ground, from which new forms emerge. The primary forces are iterations that result in complexifications of relationships as the forms self-organize into a hierarchy of levels. All forms on the same level are co-emergent and share co-dependent and relative, multi-perspectival worldspaces, the whole of which can only be known collectively. Higher levels are related to lower levels through ever-more increasingly complex meta-theoretical types of organization. Onto-logics contrasts sharply with either of these two narratives by starting with an open, fully transparent understanding of mind as the creative faculty through which new world-realities arise. Onto-logics starts neither with a set of super-ordinate transcendent logics, nor from the positing of pre-given structures. Rather, onto-logical thinking begins in full awareness of the task of thinking in terms of creative imaginaries whose potentials it is to call forth, carry forward, or newly enact a re-envisioned reality. This onto-logical process approach in which a narrative is in a sense born outside of time, requires that we assign an anterior and a posterior pole (an arrow of time) internal to the narrative which carries forward through process dynamics where generative processes prescribe both the arrow of time, and all other relevant constructs, as well as describe process dynamics that are generative of all the relevant structures. As a result, the structural forms are related both back to the processural continuum, and as such, can be traced back to origin, as well as to the transformational dynamics that give rise to the generative orders from which the structures arise. The ground of the onto-logical narrative therefore, is not “in the world” but arises implicitly from a “knower” whose inherent situatedness in the world (in the Heidegerrian sense of Dasien’s world-dwelling) authenticates her as a valid percept-or (one who receives percepts). Kosmocentric implies a non-discriminating awareness—such as Trungpa(2004) describes as an astronaut free-floating in space. Co-dependent Arising implies the temporal freedom of simultaneity, and Spontaneous Arising implies equanimity of existence and non-existence. Are these, afterall, the fundamental degrees of freedom at the horizon of our view as we slip into our aperspectival future(s)? from which of course, we would already be slipping free… . Gendlin (1991)speaks of the implicit as being more precise than the language that carries forward. When Anne Klein and Tenzin Wangyal (2006) both describe the Bon-Dzogchen non-conceptual notion of authenticity as open awareness which is not a consciousness, as well as the process of authentication, I believe they are expressing a sophisticated, deeply-held understanding of view. In the following section we will see that Gendlin eventually does see the need to re-conceptualizes the notion of “the body” through his process philosophy approach – a move toward onto-logical thinking. For a sense of these new hori-zones, I would highlight Jason Brown Theory of Cognitive Microgenesis (zone 9); Enrique Dussel’s work ont Transmodernity (zone 10): Evan Thompson’s Naturalilzed Phenomenology (zone 11) and a some significant further development of Bruno Latour’s Actor-Network Theory (zone 12). In his earlier work, Wilber considered the higher perspectives associated with state-changes as part of the cognitive line. This became controversial as his critics argued that people from earlier cultures had access to higher states, without having evolved higher cognitive capacities. Thereafter the states were assigned a loose correlation across the stages in what came to be known as the Wilber-Coombs lattice. If we interpret state-changes as the dropping away of existing perspectival c constraints as this paper suggests, then this would explain how people at any cognitive level can experience state changes. On the other hand, this paper also suggests that the temporary freedom from perspectival constraints experienced in state changes provide the potential for entirely new types of perspectival structures (or new types of structural arrangements in a process field) to become stabilized to the extent that they become identified as higher levels in the cognitive stage line. This would be consistent, then with thinking of higher level perspectives, associated with state-change insight, to be third-tier cognitive levels. This interpretation would also explain how meditation might accelerate cognitive stage development. Although there is an extraordinary amount of Buddhist scholastic literature around these notions, it may be impossible to entirely grasp their inherent views outside of an injunctive or soteriological practice, or without having a state-changing experience where the relevant perspectival constraints drop away allowing one direct phenomenological experience of the view. Holding both notions of co-dependent arising and spontaneous arising together, is another challenge entirely. Which one is given emphasis has created inter-scholastic debate among Eastern traditions for centuries. Bonnitta Roy, A Process Model with a View. Presentation for First Integral Theory Conference 2008 at JKF University where it received an honorable mention for academic achievement in integral theory. It is always already undone, you see, and always already over. In the simple feeling of Being, worlds are born and die—they live and dance and sing a while and melt back into oblivion, and nothing ever really happens here in the world of One Taste. … And I-I will be there, as I-I always have been, to Witness the rise and miraculous fall of my infinite easy Worlds, happening now and forever, now and forever, now and always forever, it seems (2000b, p. 623). … in that unitary seamless sizzling Now, which is this very moment before you do anything at all, it is, quite simply, over. Which means, it has, quite simply, begun (2006, p. 346). The feelings expressed in these passages can be found in literature from all over the world. They point to a poignantly spiritual experience that I call an “ontological encounter”, or alternately, the “ontological dimensioning of being.” This “ontological dimensioning of being” is so constitutive of human experience, that it often goes unrecognized. For example, at one time in our lives we do not have the cognition of object constancy. But once we develop to the level of concrete operations, we experience objects as if they had always and already existed. This is a curious and important aspect of human experience – the ability to experience or come to know about something in time and the simultaneous experience of this something having existed for all of time and perhaps for all of time to come. In the ontological dimension, time present, time past, time future are all somehow entangled in a singular ontological encounter. The process model illustrates this characteristic of the ontological with the vertices “anterior” and “posterior”. The posterior aspect is that which is experienced in time and the anterior aspect is that which is experience as eternally present. It is important to note that while we tend to concretize the ontological dimensioning of reality – a process, a verb, not a noun or thing—by assigning to its anterior aspect the cognitive categories of pre-given existence, this is rather superfluous epistemological content that is added onto the ontological experience, not content that arises within the ontological dimensioning of reality. At its most basic form, the ontological dimension is a capacity for opening, and therefore view can be thought of, fundamentally, as degrees of freedom. View therefore, does not refer to the fullness of perspectival cognosis, but to the opening up or into, the freedom and liberation of gnosis. Alternately, where all the fullness evolving in the epistemological field correspond to the Buddhist notion of vijnana, the experience of gnostic revelation that entails view corresponds to the Buddhist notion of prajna. Finally, we can interpret view and the degrees of freedom in relation to the Dzogchen narrative of the principle of EVAM, where E represents the dynamics of the opening of “space” to entice and accommodate the creative arisings of VAM, and alternately, VAM represents the dynamics of creating and “filling up” space, and enticing E to further self-liberate as space. This then, is the real meaning of the Dzogchen admonition to “be mindful of one’s view”, that is to be mindful of the capacity of open-ness and degrees of freedom required to accommodate perceptions and perspectives, actual and cognitive occasions alike, in a fully open and truly self-liberated view. i Note: this presensing correlates with the presencing at the bottom of Otto Scharmer’s U-Process, which requires one to unravel the structures of the self, and access a deeper originary source. ii Note: this is the level that Gendlin asks individuals to access during his “Focussing” method of inquiry. However, his description of the location of this level is incorrect—the affect and image levels are prior to the body and therefore are not bodily felt feeling. Merleu-Ponty and his followers make the same mistake in their attempt to anchor language phenomenologically as “embodied”. Language is not at its most fundamental level “embodied” but “enfolded” deep within the cognitive occasion. iii Curiously, this is the same argument that underlies the complex scholastics between Tsonkhapa and Gorampa as described by Sonam Thakchoe in his new book The Two Truths Debate—I as the two Buddhist scholars attempt to explain the difference between conventional mind (relative truth) and Buddha-nature (absolute truth). Bonnitta Roy, A Process Model with a View. Presentation for First Integral Theory Conference 2008 at JKF University where it received an honorable mention fo academic achievement in integral theory. Put bluntly, perception, prehension, awareness, consciousness etc., are all 3rd person, monological abstractions with no reality whatsoever. [emphasis mine]. As far as we know, or can know, the manifest world is made of sentient beings with perspectives…” (255). This is a post-modern humanistic version of Humean idealism, since Hume’s radically solipsistic stance didn’t even allow for the independent existence of other selves. Yet another version of philosophical idealism, is based on the thought of Kant, who studied Hume’s philosophy, and felt he improved it. Kant imagined a really real world “out there” of actual noumenal entities—but said we had virtually no direct access to this noumenal realm. But Kant believed that the laws of numbers and logic were also part of the noumenal, and therefore had great trust in the power of the rational mind to re-present the noumenal realm in symbolic, epistemic ways. The modern version of this view from cognitive science has been called “the correspondence theory” of cognition—that the ur-reality of subjective phenomenon must somehow “map directly” onto the real-reality of an objective world; so that the goal of cognitive science becomes the attempt to describe the “rules of translation” that might accurately re-present the actual in the phenomenal. The process model does not agree with either version of idealism. The process model does not maintain that all of reality is consensual reality co-created in intersubjective space; nor that all of reality is merely a perceptual illusion of the self, in the Humean sense; nor that there is a boundary between a noumenal world “out there” that we have no access to, except through representational faculties of rational mind. In fact, the process model was written to point to a view where there is no sharp cut between self and world, subject and object, body and mind, perceptions and reality, “in here” and “out there”, phenomena and noumena, ur-reality and that which is really real. What the process model says, is that we are inextricably part of the “noumenal” or “actual” or “really real” world through our very being-in-Being (which is, more precisely, always and already a becoming-into-being). This is an ontological view – Kant would have considered it a transcendental knowing—and therefore, even in the Kantian context, would not be expected to have a correspondence to the phenomenological reality. But when he shifted to the epistemological question of “how can we know the world”, Kant’s notion of the inaccessibility of the noumenal became inextricably entangled with his philosophy. From the view of the process model, there is not a separate “world out there” that can or cannot be known; nor a knowing subject “in here” that somehow, some way, must apprehend a world. According to the process model these aspects of “world” and “subject” arise as a cognitive occasion, which is not a person, nor a subject, nor a mind, nor a self or sentient being. According to the process model, and its process philosophy, the cognitive occasion is a duration of a particular kind of enfoldment in a processural field. The dynamics in this processural field is the fundamental nature of reality. These dynamics create constellations of enfoldments (and their traces), which endure (and retreat) in the moment-to-moment occasioning of “world”, “subject”, “mind”, etc… but more precisely as experience of enfoldment such that, for conventional experience, self is enfolded inside mind, which is enfolded inside body which is enfolded inside an objective world with other selves. In this narrative, there is no boundary between the “really real” processural field, and the cognitive occasion that arises as certain kind of phase transitions within it. This view is neither idealist nor realist, since there is no longer a dichotomous moral to the story. But how real can this meta-narrative be? These kind of questions about reality and meta-narratives, do not only plague philosophers. In Copenhagen, 1927, Neils Bohr and Warner Heinsenberg contemplated the implications of quantum mechanics, and while their discussions and opinions on quantum matters subsequently came to be known as “the Copenhagen interpretation”, but according to the online Stamford encyclopedia, their individual opinions actually varied quite significantly. Heinsenberg concerned himself primarily with epistemic uncertainty, and the limitations of knowledge; whereas Bohr’s more Kantian view, contemplated the relationship between symbolic representations of knowledge (mathematics, linguistic narratives) and the supposed noumenal reality of the world. Bohm’s vision was that one could close these gaps through a deeper understanding of the system as a whole. His insight was that in order to be coherent, thinking had to come from the view of the whole, which in this case, required one to take the point of view not of the subjective investigator, nor the objective reality (the measurement) but from further back, outside the system as a whole, and think from the kind of processural order that might gives rise to both the investigating subject and the experimental outcome as one coherent “movement”. As with the process model, this view from the whole, therefore, has to be an ontological view—one of the becoming-into-being of the parts of the system from the whole. In the case of the electron, Bohm might say (in lay person’s terms) that both the electron and the investigator are entangled in one coherent state at every juncture in time, yet they are entangled in one state prior to measurement– an indeterminate state– represented by the wave-particle duality of the electron and the investigator’s epistemological unknowns, and in a subsequent state, they are entangled in a determined state, where both the electron particle-ness and the relevant information has been determined. The indeterminate state is the state of un-actualized potentials, and the determined state is the state of realized actuals. This is the basic “movement” in Bohm’s theory as well as in process philosophy in general. According to Bohm, “movement” itself is fundamental to reality. He envisioned a “holomovement” of two processural orders, the one an implicate order, the other an explicate order. In Bohm’s holomovement, the implicate is ordered—that is, has a certain shape or architecture, which he envisioned as being enfolded. The dynamics of his holomovement prescribe the unfoldment of this enfolded order to generate the explicate order—the realm of phenomenal experience and conventional reality. Bohm also maintained that in this process of unfoldment (from the implicate to the explicate) that the informational content of the implicate order (the rules that give it a particular shape)—that this information was in-folded into the explicate order as it unfolded from the holomovement. In other words, Bohm creates a scenario where the processes internal to the implicate order govern, in a sense, what unfolds in the explicate order. According to Bohm the implicate is a higher-order reality than the explicate—which led him to the necessity of positing an entire series of ever more subtle levels of still-higher implicate orders. In their most fundamental aspects, the process model and Bohm’s holomovement are surprisingly similar. Both consider movement or process as fundamental—that reality is fundamentally processural; and the dynamics of enfoldment are the significant features of the process/ movement in each theory. However, the process model completely inverts Bohm’s theory, inviting us to imagine a processural field that has no such boundaries as between implicate or explicate, and does not require an order “outside or beyond” but runs according to its own nature – its processural dynamics that generate the actual and the real. The process model hypothesizes that the dynamic features of the cognitive occasion must be consistent with the dynamics that give rise to any postulated actual occasion—of whatever nature one imagines that to be, without imputing onto the actual occasion the particular set of conditions of structural order that give rise to cognitive occasions as discussed in the previous section. An actual occasion might be considered to be a truncated path in a cognitive microgeny, or something significantly or even entirely different than the generative patterns of the cognitive. However, the process model hypothesizes that just as in the case with the cognitive occasion, any actual occasioning occurs through phase transitions in the processural field that generate dynamic enfoldments (and their traces). If these enfoldments are construed as structural shapes of intricate dimensions in the processural field, we arrive at the uncanny coincidence between this process theory and the kinds of enfolded intra-dimensional shapes that comprise the Calabai-Yau manifold in string theory. In the process model, this processural field itself, corresponding to Bohm’s implicate order, has no shape, and no epistemological content, therefore no “information content” to somehow “pass on” into its processural descendents. In the process model there is no boundary that separates orders at all—there is only the dynamic processural field, and its phase transitions that create constellations of enfoldments (and their traces). Whereas Bohm considered conventional reality as an explicate order that unfolds from a separate (implicate) order, the process model sees conventional reality (cognitive occasioning) as well as allows for non-cognitive actual occasionings as an enfolding process of the processural field that is the totality. What these hypothetical non-cognitive actual occasions might be represents new process thinking beyond the scope of this paper that I am currently working through. I hope to demonstrate the possibility that the phase transitions in the processural field that do not fully articulate as cognitive occasions might represent a constellation of dynamic interactions that can be interpreted in terms of what Stuart Kaufman calls a “fitness landscape” and may correlate with Kaufman’s realm of pre-adaptation. The AQAL matrix is a very convenient tool for identifying the methodologies of inquiry across various domains of knowledge. AQAL analysis has proven to be remarkably successful approach for incorporating methodological pluralism in one’s work. The first two issues of AQAL Journal are filled with examples of this kind of rigor. However, the AQAL matrix is less successful at describing one’s own Being-in-the-world—how the self experiences itself in its own situatedness. For example, although I may be able to feel my mind taking on or switching between different perspectives (first, second, third), I don’t experience my mind or myself as a 4-quadrant matrix splayed out in 4 directions, UL, UR, LL, LR. My most basic attention doesn’t “shift” up, down, right, left, when I take on different perspectives—it doesn’t “move around” in two-dimensional matrix space. Notice that the progression lays down levels of interior-exterior relations, such that the core is felt as a deeper interior than the self, which in turn is felt as a deeper interior than the mind, and so on until we experience a fully “exteriorized” objective world in space-time dimensions. The experience of “other” selves is similarly an “exteriorization” of an internally accessible experience of “self” onto exteriorly appearing/existing agents. How far one goes in assigning “selfhood” to other exterior agents various according to culture and individual, as both human and non-human animals can qualify, as well as inanimate objects in such as dolls in the case of children, or amulets in the case of shamanistic projection. Notice also that what type of enfoldment determines what kind of experience arises, such that the above sequence is a formula that represents conventional waking reality, but what would the formula for conventional dream state look like? Or for lucid dreaming? There needs to be different formulas for pre-conventional experiences such as the urobic period and the period of primary narcissism; for non-normative states such as autistic, schizophrenic, and neurophysiological rarities where people loose the apperception of time or place, or of having a body or mind. There would be a different formula for the state of “flow” that artists and athletes report; and still different formula for deep meditative states, transpersonal experiences, unity experiences, out-of-body experiences, near-death-experiences, and other experiences of altered states. What would the formula for deep dreamless sleep be? The point is, with respect to an experiential center of reality—whether that be a fully realized subject, a pre-subjective surrogate, or a trans-subjective witness—each of these arise through a process of structural enfoldment that lay down progressive layers of interior-exterior relations through whole-part (one-many) transformations in a space-time dimension. These three conditions, then, the condition of interior-exterior, the condition of whole-part (one-many), and the condition of space-time are the conditions of structural enfoldment under which the experience arises. These conditions can be mapped as a set of perpendicular vertices, which represents the aspects of interiority-exteriority as the horizontal vertex, and the tendency towards being one (unity) or many (plurality) as the vertical vertex. It is easy to see that this arrangement creates the conditions of the AQAL matrix in which the quadrants are horizontally delimited by the conditions of interiority and exteriority and vertically delimited by the conditions of singular (one) and plural (many). We can imagine these vertices as describing a process field which creates successive structures of enfoldment along the direction of an arrow of time. The above diagram then, represents the epistemological field, and the process of structural enfoldment in time, which generates the cognitive occasion. What kinds of structures might these be—and is there any evidence that cognition arises in this way? Affect: Cognitions that articulate to affect stage are primordial feelings, like a deep intuitive feeling that has not yet attached itself to an image or word. For example, it is common to wake up from a dream with a clear “feeling” of the dream without being able to ascribe images or words to the dream. For example, instead of being able to say that in the dream “I opened a door,” one would be pressed to say “it was as if there were a door and I opened it.” The affect level “meaning” is clear, but it is only after the fact of awakening that we are required to search for appropriate or sufficient symbolic or linguistic forms for it—and the measure of sufficiency of those attempts can be gauged against the clearly present affect. Affect-level cognitions are not to be confused with “emotions,” which are more complex structures. Object(world)Space: The furthest articulation (or discharge) in Brown’s theory of microgenesis. This is the point where cognition has articulated to object orientation that constitutes a world. Intersubjectivity-as-context: the context created by multiple intersubjective structures (i.e. meshworks) which are constitutive of the subject and create the space in which both subjects and objects arise (e.g. physical laws, morphic fields, linguistic, moral cultural, biological, and aesthetic structures). These cultural contexts, backgrounds and practices are nondiscursive and inaccessible via direct experience. Subjective Unification is the crucial step in which the self in the process of becoming, concretizes as a unified entity of being – the subject qua ego. 1) The dynamic operators are represented by the valences “interior-exterior” and “one-many”. 2) The duration of the process from core to world, constitutes an arrow of time, and the direction of the process, from core to world, constitutes spatial extension; thus creating a local here-and-now or spatio-temporal dimension. 5) protraction is the phase that creates a fully exteriorized world, and along with it, spatial extension wherein will/drive transform into their exteriorized form, intention. 6) projection characterizes the “movement” back toward interiority, as the original aspect of interiority is now projected onto/into other fully exteriorized body/objects. This projection also has the quality of reflection—wherein one’s interiority is reflected into/onto another(s). 7) the final phase transition is unification where the fully realized subject emerges as the unit of being that stands in for its becoming—and under conventional experiences, henceforward goes on to be the “subject” that navigates experience, rather than the subject that arises as the cognitive occasioning of reality. Alternately, in purely process terms, we can say that each cognitive occasion arises through the mutual interactions of innumerable phase transitions of varying momentum (representing the stage at which the “outward” movement discharges) and attenuation (representing the traces that persist in the “inward” return) that create an “ecology” of structural enfoldments in a processural field. As a way to get into the workings of the process model, I want to make the distinction between three meanings of perspective I glean from Wilber’s writing. The first meaning of perspective, relates to perspectives that a subject has – which means they entail a cognitive subject already in existence. Because this meaning pertains to how we know what we know about the world, I like to refer to it as the epistemological perspective, or EP. 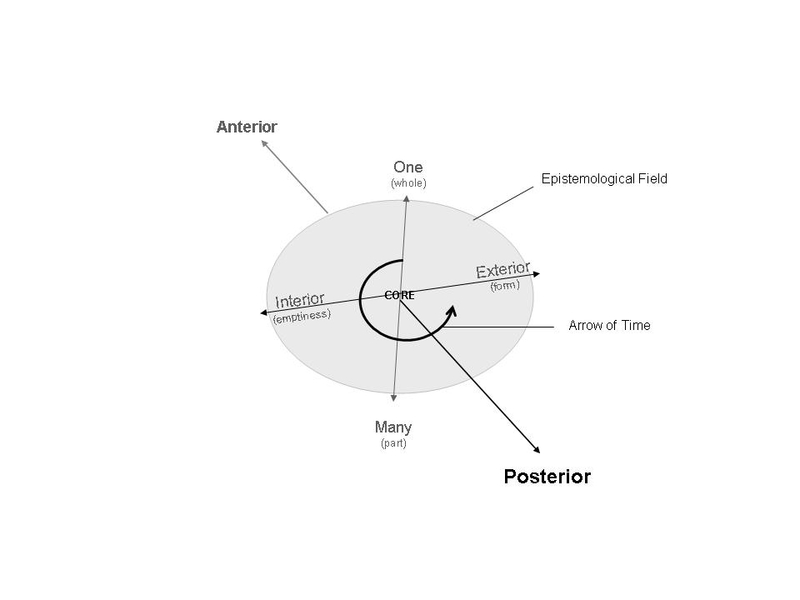 This epistemological meaning has two parts: 1) one that corresponds to methodological pluralism, and the kinds of narrative perspectives we adopt during intellectual inquiry that name the eight methodologies, and their indigenous perspectives – phenomenology(inside) and structuralism(outside) the UL subjective domain, cognitive science(inside) neurophysiology(outside) the UR objective domain, hermeneutics(inside) and ethnomethodology(outside) the intersubjective domain, and social autopoeisis(inside) and systems theory(outside) the interobjective domain—and 2) a meaning that corresponds to the perspectives a subject can take, i.e. a first person, second person, or third person (I/we/its) perspectives. A significantly different meaning of the term perspective in Wilber’s writing is a metaphysical meaning, as when he says that the “kosmos is composed of perspectives all the way up and all the way down.” The metaphysical meaning of perspective, or MP, appears not to depend upon a knowing subject (aka a human being)—but to be a statement about reality itself. According to Wilber, these are the perspectives that are related holonically, as a result of the process of transcend-and-include. The third kind of perspective is fuzzy in Wilber’s writings. It occurs most explicitly in Integral Spirituality, although it has precursors in some of his earlier writings. This is the meaning of perspective that Wilber attempts to correlate or conflate with the Dzogchen meaning of view. Here Wilber incorporates the concepts of emptiness and form and their non-dual integration, with the notion of emptiness and view-as-perspective and their non-dual integration. Therefore, choose your View carefully. And make your View or Framework as comprehensive or integral as possible, because your View—your cognitive system, your co-gnosis, your conceptual understanding, your implicit or explicit Framework—will help determine the very form of your enlightenment. The process model sees this as a crucial category error that results from conflating (or confusing) the framework of cognition and its epistemological perspectives, with the ontological, a-perspectival aspects of Being. This category error arises when we overlay the static structures of our epistemic framework onto the ontological experience of Being. This ontological experience is an a-perspectival, a-temporal and a-local arising which is addressed in the final section of this paper. The next two sections deal with the epistemic and metaphysical meanings of perspective through adopting and adapting the theories of Jason Brown and microgenesis and David Bohm notion of the holomovement. The process model attempts to describe the same underlying dynamics that generate both the cognitive occasion and the actual occasion, in ways that are consistent with the core of both Brown’s neurophysiology and Bohm’s physics. Fundamentally, these dynamics can be described as generative processes that create conditions of structural enfoldment through interior-exterior “movements” and whole-part transformations. The details of which we now turn.